The demand for various forms of energy, especially electrical is increasing gradually. This requires incorporation of new power plants. Apart from this, conservation of energy available implementing relevant measures & technologies has given rise to Energy Conservation Solutions. As such, we offer premium & economic energy conservation solutions to our clients across the globe. We are offering an excellent quality of Energy Conservation Solutions. We are concerned about available Energy Resources on the Earth and its Conservation Opportunities. We continuously work to evolve Waste Energy Recovery and Energy Conservation Opportunities. 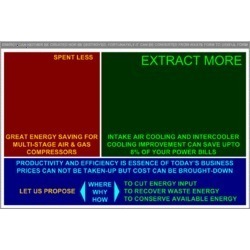 Looking for Energy Conservation Solutions ?